Like every other band in the world in 2014, Stoneburner hail from Portland, Oregon and have been challenging ears, minds and the walls of live music venues since 2011. They’re a somewhat incestuous (their word not mine!) ensemble who today share a house together and whose childhood upbringings provided enough successful, yet unlikely, intersections of family and friends to forge a four-fold mission to “dominate through amplification and soul-cleansing catharsis”. Having toured with the likes of Yob, Graves At Sea, EyeHateGod, Neurosis and numerous other cranium-botherers, it’s clear that their debut record ‘Sickness Shall Pass’ was always unlikely to be a simple one-off flash-in-the-pan. Now on the often difficult second album, Stoneburner are showing no signs of cooling off. Straight from the harrowing, bed-ridden wretch of a being on the front cover delicately constructed by the band’s fifth and invisible member J.J. Shirley, it’s unlikely that the music contained within is going to amount to ten songs in 4/4 topped off with a cheesy Fu Manchu cover. No sir. ‘Life Drawing’ is a complex and punishing listen that explores many avenues and emerges as a grizzled concoction of its numerous influences. Mastodon’s ‘Remission’ is an obvious and immediate, albeit lazy, point of reference on the likes of the brutalised opener ‘Some Can’ and the searing energy of ‘Done’. Elijah Boland and Jason Depew’s guitars quake and screech along with the unhinged rattle of Jesse McKinnon’s drums in a rather Brent Hinds versus Bill Kelliher-esque fashion. There’s an abundance, but not overuse, of fretboard-topping motifs as the riffs judder by, slouched and twisted as if somehow under the strain of having to carrying a heavy backpack full of Neurosis and Noothgrush vinyls down a crooked and cobbled street. ‘You Are The Worst’ ups the ante further, employing Damon Kelly’s bass guitar as some form of audial battering ram to smash down the front doors of Fort Fister and Hotel Hooded Menace. It’s not all simplistic thud n blunder from start to finish, I must stress. The solemn melting pot of tension that is ‘Caged Bird’ takes several minutes to stretch its wings and take flight. If you dig the serene-to-bulldozing-in-a-matter-of-seconds approach of the likes of Thorr’s Hammer and diSEMBOWELMENT, then you might as well pull your pants down and offer yourself unequivocally to your new favourite band. The only slightly disappointing feature of ‘Caged Bird’ is that you’re forced back through a similar riff vortex as featured on ‘Some Can’, but the eventual rewards are rich with the track’s closing evisceration of all that is bright and promising in this universe. If there’s one song that sums up ‘Life Drawing’, which granted is a stupid objective to try to achieve anyway, it’s a likely to be a tie between ‘Caged Bird’s dynamics of devastation and the eerie morbidity of ‘Pale New Eyes’. Offering a different slice to this death-doom pie of punishment is ‘Done’, a more upbeat exercise in clean guitar tones and inter-switching song structures. If VERY early Mastodon is still in your last.fm top10, then this should be enough to shake your foundations and bang your head all at once in a breakneck rampage towards a snail-slow, gravel-dredging conclusion. Similarly, the face-creasing, claw-summoning grace of ‘An Apology To A Friend In Need’ will strike a chord with grimy doom-mongers and clean-shaven post-metallers alike. It’s actually one of my favourites on the record; somehow managing to sandwich several minutes of sweetened, ethereal bliss between two hefty slices of gut-wrenching bass and throat-bleeding vocals. Urgh, yummy. The other surprise moment on ‘Life Drawing’ comes with the multi-layered beauty of 17-minute closer ‘The Phoenix’, which begins with some whale-calling, string-bending and sweeping flourishes of acoustic guitar before diving into an ocean of almost neoclassical serenity. The crunch is worth waiting for at around the 9-minute mark as McKinnon and Kelly’s bellows of “SAVE YOURSELLLLLF!” echo around the caverns built by Boland and Depew’s walls of guitar. ‘The Phoenix’ soars further for a few minutes before floating back down to the low-lying undercurrents of the likes of My Dying Bride and Paradise Lost before crashing out with a bang under McKinnon’s deafening drum assault. 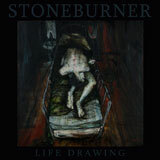 If our entire planet were to suddenly burst into flames and burn down through its tectonic plates to the very core before exploding across the galaxy, Stoneburner’s ‘Life Drawing’ would be a fitting soundtrack. I’m not going to lie, it’s a tough listen and a very very long one at that, but it remains an unexpected surprise contender for “fiercest subterranean death-sludge” record of the year. Buy it now before we all burn to stone.